Two Moves To The Perfect Warm-Up! 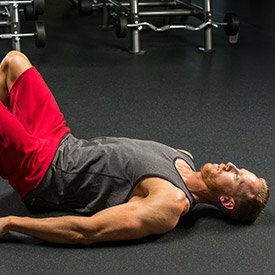 Why spend valuable training time on a complicated warm-up you hate? Hit the weight room feeling strong, focused, and agile after performing these 2 techniques! Your body is amazingly designed. No one had to teach you how to go from a crying, pooping wee one on the changing table to a child who could stand upright. It was built into you. Think about it: You learned how to walk, squat, climb, jump, and run without any major influence from the outside world. No direct coaching. No videos. No seven steps to anything. You learned how to move automatically. Know what else you didn't need? A warm-up. And yet, when we go into the gym to do, well, pretty much anything, many of us spend lots of time and energy performing a half-hearted warm-up we can't stand. Why? It's getting the blood flowing. It's movement prep, or prehab, or muscle activation. The names and protocols come and go, but the general idea is that you're always chasing a kind of "readiness state" where you'll be stronger and more efficient in whatever comes next. I've tried pretty much every warm-up style there is over the years, but these days, my prep for heavy strength training takes a max of 10 minutes on a bad day—and 5 of those minutes are largely spent sitting nearly still, focusing my mind for the upcoming task. The other five minutes are filled with simple exercises that require no special equipment and take up very little room. I want to introduce you to two very effective, if somewhat strange-looking, techniques that will go a long way toward helping you reach the readiness state more quickly. Plug them into your current warm-up, and don't be surprised if you find that once you get good at them, you don't need much else. What? Breathing? Obviously it's important, but most of us take it for granted because it seems so automatic. But make no mistake: You have control over how you breathe—and you should use it! Rather than taking rapid, shallow breaths using your lungs, practice breathing using your diaphragm. In my experience, this is one of the most important things you can do for your overall health and well-being. Why? A surprising amount of research has shown that diaphragmatic breathing is simply better breathing. One benefit is that it more fully oxygenates the blood, getting essential nutrients to the organs, tissues, and cells. Deep breathing balances the halves of your autonomic nervous system. Most people are sympathetic-dominant—the "fight or flight" system—from being chronically over-stressed, but diaphragmatic breathing stimulates the parasympathetic nervous system, which is a "resting and digesting" state. Being chronically sympathetically-dominant can negatively affect your endocrine (read: chronically high cortisol levels, bro), digestive, and immune systems, leaving you weaker and less able to perform and recover from your workouts. Deep breathing activates your deep abdominal stabilizer muscles, those responsible for stabilizing your spine and pelvis so you can move and train safely. Think of your deep abdominal muscles as a box. The diaphragm is the top of the box, the pelvic floor is the bottom, the transverse abdominis and internal obliques are the front and sides, and the multifidus is the back. It's the diaphragm that modulates the intra-abdominal pressures necessary for the reflexive stabilization of the spine and pelvis when you are moving under, say, a heavy barbell. Unfortunately, most people can't breathe diaphragmatically anymore. Or rather, they can, but they forgot how long ago and are now locked into being "emergency breathers," both in the gym and in life. They survive on shallow, fast breaths from their chests, shoulders, and neck, which locks up the neck, shoulders, and upper back, preventing them from maintaining full, healthy ranges of motion. When the joints in these areas no longer move properly, the muscles no longer move properly. Add a heavy weight to the equation, and you'll see people trying to force muscles to move where they once went but can now no longer go. The result, as you can imagine, is often an injury. Lie on your back with your knees bent, feet flat, and hands on your stomach. Breathe in through your nose, into your pelvis, and even envision breathing into your feet. Take in about 75 percent of a maximum breath. You should feel your entire midsection expand, not just your stomach. A popular trend in the fitness industry today is to use a foam roller for what is known as self-myofascial release, which (depending on who you ask) releases built-up adhesions in muscle tissue and increases tissue extensibility. Another effective way to do this, while also boosting your body's proprioception—your brain's 3-D awareness and control of your body in time and space—is through rolling. Our muscular system is connected together in a cross-body "X" design through neurological and fascial connections on the front and back of the body. To help you envision this, think about your walking gait: You use contralateral limb movement, where the left arm and right leg and right arm and left leg operate in synchrony. Same goes for sprinting. Rolling trains the body's ability to properly use the anterior and posterior X's by tying the opposite hips and shoulders together. It may sound weird, but rolling has rapidly become a staple corrective movement for a wide range of high-level athletes. The reason: How well you move in opposite movements—front to back, back to front, top to bottom, bottom to top, left to right and right to left—says a lot about where you're restricted. If your core isn't up to the task, or if your left shoulder is far more limited than your right, you'll know right away. And the best part? The diagnostic is also the treatment. The more you do rolling, the more the stiffness and tightness is eliminated and the more balanced the body becomes. For your warm-up, roll from each of your four "quadrants": left leg, right leg, left arm, right arm. And when rolling from the lower body, keep the upper body still, as if paralyzed. Same thing when rolling with the upper body. Don't use the legs: Keep them still as if paralyzed. 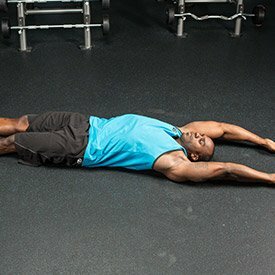 Lying on your back with your arms overhead, bend your right knee and pick it up as if you were stepping onto a high box. Now move your left across your body and straighten it at the same time. You should automatically roll onto your stomach. Next, pick your right leg up with your knee bent, the bottom of your foot pointing to the sky, and try to reach your right heel across your left leg. This should pull you onto your back. Repeat for five reps per leg, front and back, then move on to upper-body rolling. Lying on your back with your arms over your head and your legs outstretched, pick your head up and try to put your nose into your left armpit, reaching with your right hand down to your left ankle at the same time. Your lower body should remain still. Your upper body should pull your lower body over onto your stomach. 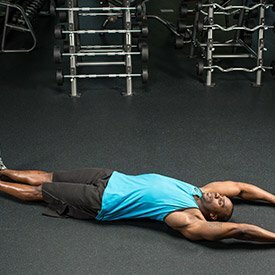 Sweep your right arm up along the floor so it returns overhead. 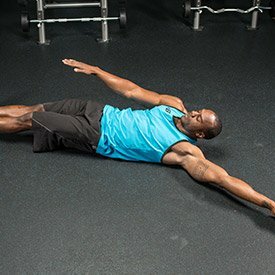 You should look like Superman flying in this position. To return, pick your head up and look across your body, reaching back with your right arm toward your left ankle. Really reach with your head and arm. You should reflexively roll onto your back, while keeping your legs still. This will take you about 2-3 minutes once you get the hang of it. Sure, it'll warm you up a little, but more than anything, it just feels great. It's like a free massage that not only puts your body back together again, but makes it work better as a result. I don't expect you to take my word for any of this seemingly crazy stuff. Instead, I want you to simply test it out for yourself. Pick an exercise and test your range of motion before you start. I recommend something that should be easy and natural, like a goblet squat using a not-too-heavy dumbbell or kettlebell. 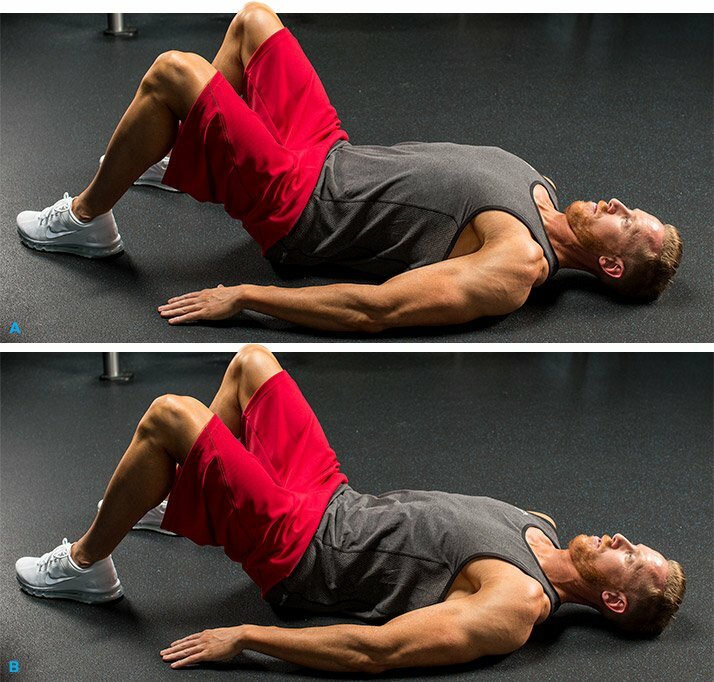 Perform two reps with no warm-up, and no prying or stretching your hips out at the bottom position. Take very careful note of how you feel. Tune yourself to what feels comfortable during the motion, and what seems uncomfortable, stiff, or restricted. Then do your diaphragmatic breathing. Then test your goblet squat again, just two reps. Do the same with the segmental rolling after both the lower body and the upper body. If you're like nearly all of the people who have done this at one of our Original Strength workshops, you'll find you feel and perform differently immediately. Don't be surprised if you find yourself repeating your "warm-up" later in the day or while you're watching TV at night.